The Farm on OMR wants you to get down and dirty, with an insect walk, farm-fit sessions and more. The sun is high in the midday sky, and there is nary a cloud in sight when I arrive at The Farm on OMR. A holiday means Ia��ve shaved off a good hour from my commute, but the indolent mood of the day hasna��t stopped others from making the drive. The restaurant is full, and I spot children squealing as they feed chickens and cows outside, while others take a quick trot around on horseback. 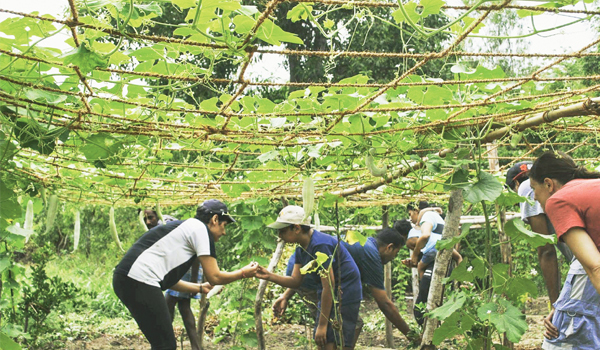 But ita��s not just a farm-to-fork meal or a quick break from city life thata��s brought me down, but a host of new activities that owner Arul Futnani and his partner Shalini Philip have initiated at their 70-acre property. From forking hay (as part of a farm-fit session), to spotting bugs and learning about sustainable farming, therea��s a lot going on. As I sit down to a lunch of Naga pork and bamboo (part of their a�?staff speciala�� menu), Arul takes me through whata��s on offer. Anubhav Agarwal, a naturalist by passion, has been visiting The Farm for years, documenting the thousands of species of insects and spiders he finds there. The visits recently translated into an Insect Trail. a�?During the walka��where people are kitted out with magnifying glasses and camerasa��I show them how there is so much life teeming around. Besides teaching them where and how to spotA� insects, we also discuss their features, the role they play in maintaining ecological balance, and more,a�? he explains. Rs 800 per person for 90 minutes. From 3.30-5.30 pm, on October 16 and 30, and November 6 and 27. When Arula��s father, Madhu Futnani, started the farm in 1974, he recalls a slower pace of life. Over the decades, the village metamorphosed into a bustling metropolis, with paddy fields giving way to apartments and office blocks. Today, his Farm Interpretation Walk gives an insight into how things were back then, the local topography and what goes into running an integrated farm. a�?Many people havena��t seen the OMR pre-development, so they are curious,a�? says Madhu, who loves going into the historya��there are irrigation tanks and culverts dating from the late 1800sA� on the propertya��besides explaining how the topography, seasons and environment affects The Farm and its inhabitants. Rs 800 per person. From 3.30-5.30 pm on October 9 and 23, and November 13 and 20. With farm visits becoming popular with children (the last academic year saw 80 schools sending over groups), Arul has included a few educational modules, too. a�?A popular one has been created around the coconut tree, where a person climbs the tree and picks tender coconuts for the kids. Then we trace its journey until it becomes copra, showing them how we extract oil,A� besides demonstrating how thatch, coir, and broomsticks are made,a�? he says. Other modules include the dairy, the vegetable gardens and the stables. Potter Kaveri Bharath has built a kiln on the property. While she has often conducted workshops here, now, every Saturday, she conducts half-hour sessions for children and adults. a�?This is a basic session, which will include mixing the clay, shaping it, simple handwork and even a go at the pottera��s wheel,a�? explains Arul. Rs 400 per person. From 10 am to 4 pm. From spotted owlets and rose-ringed parakeets to pied kingfishers, birds are a constant at The Farm. So rich is the population that Arul has teamed up with the folks at Jungle Retreat, the Mudumalai-based resort that promotes sustainable tourism. Their birder recently spent a week here, documenting its feathered life. a�?Hea��s already photographed close to 40 species, and there are still so many to be documented,a�? says Arul, adding that in the future this couldA� grow into a bird walk, among other things. Not many realise it, but working on a farm is one of the original forms of functional fitness. Murugappan S, head coach and founder of Salt, a city-based functional fitness unit, is now using the acerage and the animals at The Farm, to create a one-of-a-kind experience for fitness enthusiasts. a�?Farm Fit is a four-hour activity that replicates working on the farm, doing day-to-day tasks. We begin with feeding and milking the cows, before moving on to weeding and preparing a plot of land for sowing, harvesting crops, drawing water from the well, and bathingA� and grooming horses. Your core is activated through it all and you work out your entire body,a�? says Murugappan, adding how people who frequent gyms are often surprised by the new muscles groups they use while doing these seemingly simple tasks. All the hard work is rewarded with a a�?make your own pizzaa�� lunch. The next session is on October 22. Rs 800 for children and Rs 1,000 for adults. A farm and a restaurant translate to tonnes of waste. Arul, who is striving to make the property as close to zero-waste as possible, has roped in friend and sustainability consultant Maya Ganesh, to help him out. Her success with their composting systems and organic cleaning solutions sparked the idea for a series of interactive workshops. a�?With the aid of audio-visuals, demonstrations and hands-on learning, Maya will take sessions on waste management for homes (NovemberA� and 19, covering everything from waste segregation and composting to reusing and recycling), and urban edible gardening (November 6 and 20, focussing on seeds, soil, transplantation and more),a�? he says. Sign up for Rs 1,500 per person.